Tag line: "Santa Claus saves Christmas for the Children of the World!" Not all Holiday films give you the warm and fuzzies. 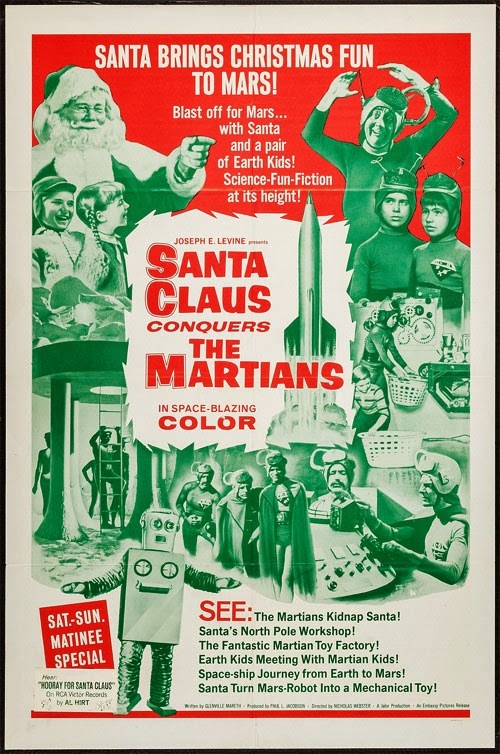 Some might even give you the dry heaves, like 1964’s Santa Claus Conquers the Martians, a saccharine-sweet schlockfest that ranks as one of the worst motion pictures ever made. The children of Mars are walking around in a funk, and Martian leader Kimar (Leonard Hicks) wants to do something about it. After consulting with an 800-year-old soothsayer (Carl Don), Kimar decides the best course of action is to hop in a rocket, travel to earth, and kidnap Santa Claus (John Call), who will then spread Christmas cheer by delivering presents to all the good Martian boys and girls. Of course, not everyone thinks this is a good idea; Voldar (Vincent Beck), Kimar’s chief political rival, believes the children of Mars are becoming too soft, and the last thing they need is a fat guy in a red suit giving them a bunch of useless toys. Despite Voldar’s protests, Kimar makes the long journey to earth and grabs Santa, loading him into the spaceship along with a couple of earth kids (Victor Stiles and Donna Conforti) before heading back to Mars. Things seem to go well for a while, and Kimar’s own kids (one of whom is played by a very young Pia Zadora, in her first film role) light up whenever Santa is in the room. But Voldar refuses to back down, and hatches a scheme to end Christmas on Mars before it ever has a chance to start. Santa Claus Conquers the Martians is geared entirely towards children, and was designed to be a harmless bit of Holiday fun that the whole family can enjoy. In fact, the only thing preventing it from becoming a Christmas classic is it’s an absolutely terrible movie, with an awful storyline and horrible make-up and costumes (the Martians wear green tights and have some sort of metallic paint smeared all over their faces). Even the stock footage, some of which was on-loan from the U.S. military, makes no sense (following a report that an alien ship is in orbit around earth, there are clips of pilots leaping into state-of-the-art airplanes and taking off. What exactly was a plane going to do to a ship still in outer space? Well, that’s never really explained). Perhaps the only kind thing I can say about Santa Claus Conquers the Martians is that John Call makes for a convincing Saint Nick, playing him as a jolly old man who takes everything in stride. As for the film’s other characters, they’re either: a. One-dimensional, b. poorly portrayed, or c. All of the above. Most annoying of all is Dropo, Kimar’s bumbling assistant. As played by Bill McCutcheon, Dropo is supposed to be the comic relief, though, personally, I was hoping someone would vaporize him with a ray gun! 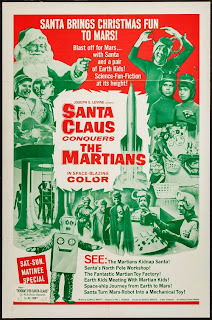 Like Plan 9 from Outer Space, Santa Claus Conquers the Martians has, over the years, become something of a cult favorite, an example of a picture so horrendous it’s now an unintentional comedy classic. And while the movie certainly fails as holiday entertainment, I guarantee you’ll find plenty to laugh about if you watch it. Be warned, though: it may take a few days for you to get that damn title song out of your head (“S-A-N-T-A… C-L-A-U-S… Hooray for Santy Claus!”).